These teapots have long been considered the best tea brewing vessels in the world. Natural minerals contained in the unique clay bodies of the Jiangsu province of China produce a variety of beautiful colors when fired. And the shapes whether natural geometric or whimsical - all impart a simple elegance and grace. 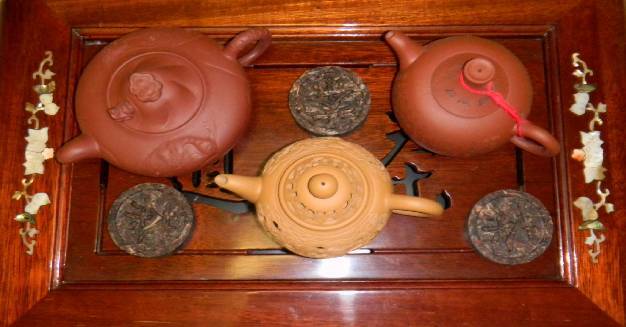 These teapots absorb the taste and aroma of the tea, so should be used with only one tea. Over time the teapot will absorb enough of the essence of the tea that you will be able to use less tea per brewing. Pretty red and blue 10 ounce teapot and two matching cups. A uniquely shape 15 ounce yixing teapot with a beetle for a lid. 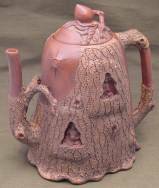 A unique shaped teapot with a vine shaped handle and a frog on the lily pad shaped lid. 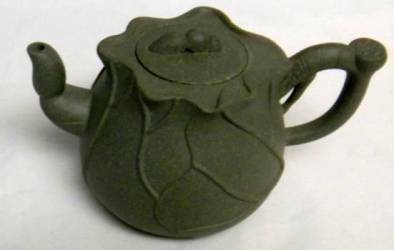 A 10 ounce peach shaped yixing teapot with a leaf on the lid. 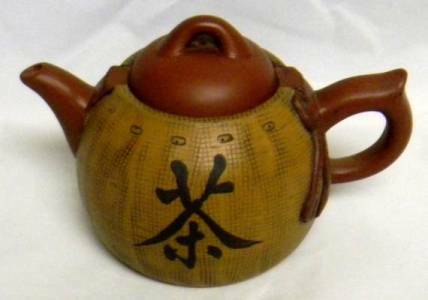 A 15 ounce yixing teapot sits in a sack with Chinese characters. Simple 11 ounce teapot made of black clay with tiny yellow freckles scattered about. A bee rests on top of this 10 ounce green yixing teapot in a decorative brocade box. A nice, simple brown 7 ounce yixing teapot with a decorative brocade gift box. 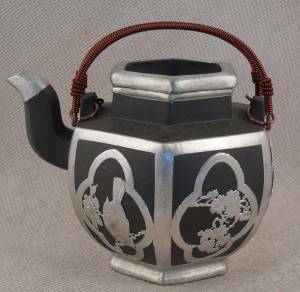 This unique yixing teapot is hand made with pewter Bird accents. 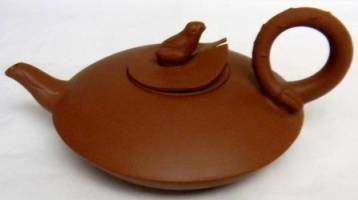 Leaf shaped 4.5 ounce teapot with a bug sitting under a leaf for the lid. 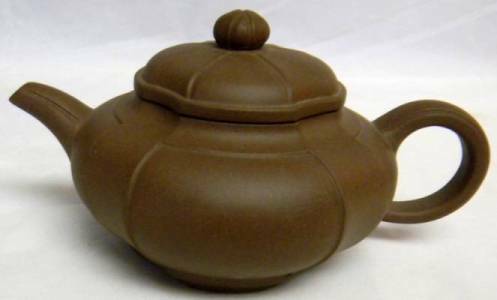 A large 14 ounce brown clay yixing teapot that has a basket weave shape. 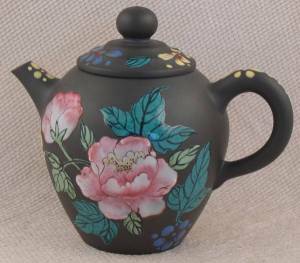 Pretty 18 ounce teapot with colorful painted raised flowers and a butterfly. 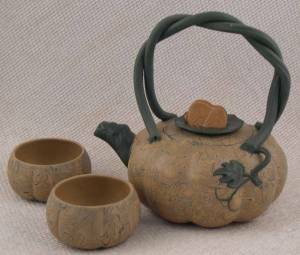 Cute 8 ounce yixing set shaped like a pumpkin with a blue twisted handle. Beautiful 13 ounce Tri Color Yixing teapot comes with a stainless steel brewing basket. 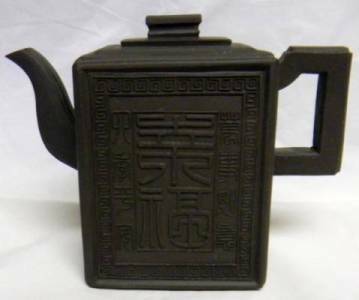 Uniquely carved 20 ounce teapot with two carvings of Buddha on each side of the teapot. 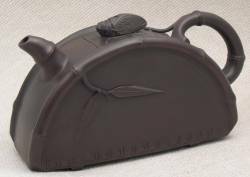 Egg shaped 8.5 ounce teapot with a dragon for the handle and the spout. 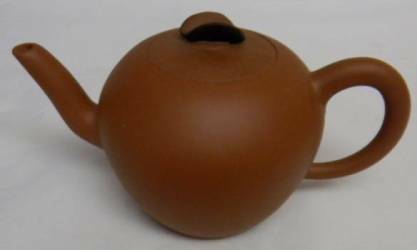 A 5 inch tall yixing teapot with a 15 ounce capacity decorated with Chinese characters.